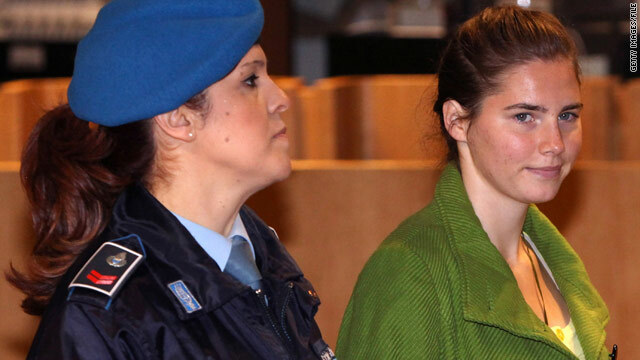 American student Amanda Knox is seen being led into the courtroom for her murder trial in 2009. She is appealing her conviction. Rome, Italy (CNN) -- A jailed Italian mobster claims he can prove American student Amanda Knox, her former boyfriend and a drifter are innocent of murdering Knox's British roommate because he knows who the real killer is -- his brother. Luciano Aviello, 41, made the statement during a videotaped interview with Knox's lawyers. He said he had tried to write the Italian court several times to say that Knox and the others were innocent, but no one ever contacted him, defense and prosecution officials said. A source close to the case tells CNN that Aviello, who has been in and out of prison since age 17, was out of prison, living down the street from Knox and Meredith Kercher and under a "protection program" at the time of the murder. Aviello is serving 17 years in an Italian prison because of his association with the Camorra crime family. According to Italian media reports and Britain's Daily Mail, he has testified against the mob at several trials, always from behind a screen to shield his identity. Kercher, 21, was found semi-naked with her throat slashed in the house she shared with Knox in November 2007. Knox and her former Italian boyfriend, Raffaele Sollecito, 25, were found guilty in December 2009 of Kercher's murder and are serving sentences of 26 and 25 years, respectively. A third person, Rudy Guede, a drifter originally from the Ivory Coast, plead guilty to the murder and is serving a 16-year prison sentence. In March, Aviello contacted Knox's attorneys, who visited him in prison to learn more about his story. Aviello told Knox's lawyers during the videotaped interviews that his brother, who was staying with him at the time of Kercher's murder, came home one night and said he had killed a girl during a botched robbery. British and Italian media have reported the brother's whereabouts are unknown and neither the lawyers for Knox nor the prosecution would comment further. "When he came to my house he had a bloodstained jacket on and was carrying a flick knife. He said he had broken into a house and killed a girl and then he had run away," Aviello said in his statement. Originally from Naples, Aviello says he was living in Perugia at the time of the attack. 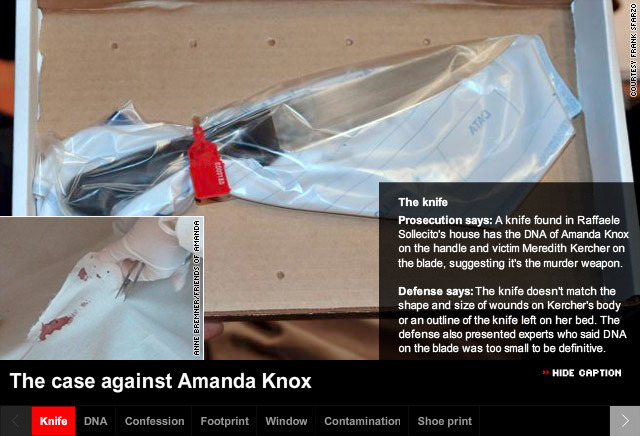 "I know [he was involved] because my brother confessed to me that he had killed Meredith and he asked me to hide a blood-stained knife and set of keys," he said, according to an attachment to Knox's appeal documents. Aviello told the lawyers that his brother said he and an Albanian man broke into the house and found "the poor English girl," Kercher, "who started screaming like mad"
The brother "stabbed her in the throat then he tried to stifle her screams," Aviello said. "Meredith defended herself like mad, scratching and hitting out at him." Aviello said he can prove Knox's innocence and his brother's involvement because of evidence he buried at his home. "I had everything under a little wall behind my house," he said. "I am happy to stand up in court and confirm all this and wrote to the court several times to tell them but was never questioned." Italian prosecutor Giuliano Mignini, who led the case against Knox and Sollecito, told British and Italian media that Aviello's claims were irrelevant since the court already deemed him not credible and didn't interview him. Mignini told CNN on Thursday he couldn't comment much on Aviello's assertions because "we need to verify his claims, in general, all of what he is saying." Mignini said he has not yet interviewed Aviello, but will begin looking into his background as part of an investigation. That investigation will include checking out the burial of the key. Knox's lawyer, Carlo Dalla Vedova, said he hopes a judge will allow Aviello to testify at Knox's appeal hearing, which is likely to take place in the fall. "The court should have vetted the reliability of the person and the worthiness of his claims," Dalla Vedova said. "We have posed again the same request to the appeals court. In filing an appeal, Dalla Vedova pointed to Aviello's letters to the courts, saying they show Knox was not able to present all the witnesses, and that may have influenced the verdict. We "can't simply investigate in the course of a trial every claim that comes up," Mignini told CNN. David Marriott, a lawyer for the Knox family, said that while they don't yet know whether Aviello's claim is valid, he feels it is only right that Knox get to air all the evidence in court. Even if the story isn't true, Knox and her lawyers should at least get the chance to investigate it and have his claims heard, Marriott said. "The fact that the court didn't even decide to question him or at least look further into the claims is a part of what Amanda's appeal is all about," he said. "We don't know the truth, but the court has the responsibility to check it out." Marriott also said he thinks it's possible Aviello's statements weren't checked out because Italian police and prosecutors believed they already solved the case. "There's no motivation I would guess for the police to actually pursue it," he said, when asked if the keys, clothing or knife Aviello claims were buried were ever dug up. "In their minds not only is it over, but why would they investigate something that might show their initial investigation was faulty."